On Saturday, Jesse and I drove to Mike’s Bikes in Sausalito as a starting point for our long bike and long run. Starting from the Mill Valley path, I ran towards Belvedere and ended up at Blackies Pasture as my turnaround point for 15 miles. 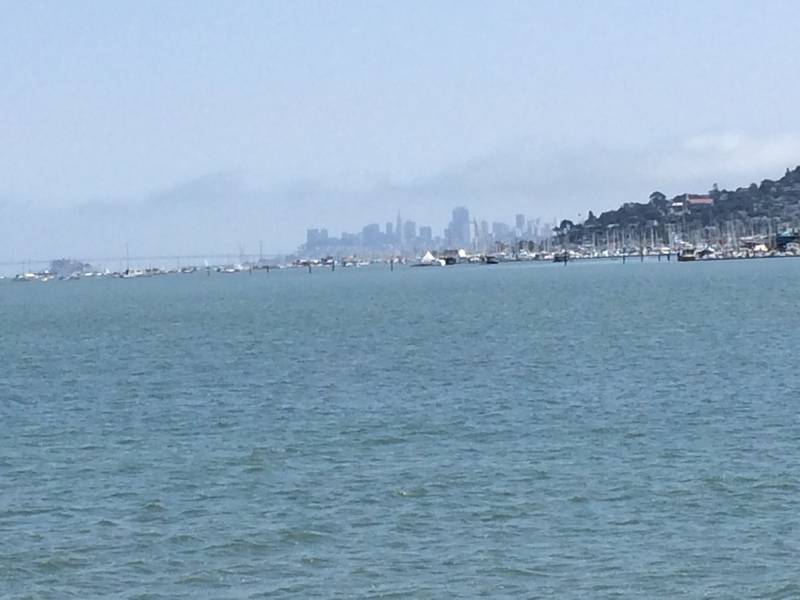 The San Francisco skyline from a different vantage point. I felt surprisingly strong on this run, which started and ended with several flat miles with rolling hills sandwiched in between. It was a cool day, but the sun was very strong; I’m very pleased to report I emerged sans sunburn. I averaged just under a 10 minute/mile pace, right on target for my long run pace, and the vast majority of the run felt effortless. This run helped boost my confidence as training for the San Francisco Marathon ramps up. While I ran, Jesse biked a solid 40 miles. This week was a recovery week for him, and this weekend he’ll crush his first Olympic distance triathlon at Vineman Monte Rio. Here’s a solid week of training! What a great view and sounds like a great run ! And what a great race the SF marathon is……. well I did the first 1/2 and running across the Golden Gate bridge was a big high for me. The first half is definitely the best half! Nice! Confidence boosting runs rock! San fran is looking great! I was waiting to read about your 15 mile run and your 40 mile bike ride, back to back. Ha That would be a day. That’s a great pace for a training run! Sound like a great day! I love when long runs feel “effortless” – always a great confidence booster!